Our first option is to point to numerous "Care Sheets" and DIY set-ups, this we feel is the best way. For this reason we put together this basic long awaited pack to try and help those struggling with the above. Please note: We are enthusiasts not professional designers, cabinet makers or experts. 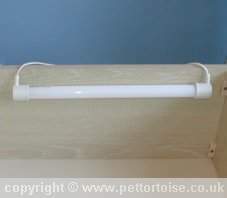 We are also unable to supply matching draws, wardrobes, bedside cupboards, or cabinets, if possible DIY. 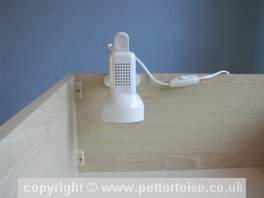 This is a basic set-up which includes the main housing elements, no electrical wiring or drilling is required! 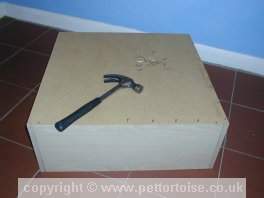 All you will need is a cross slot screw driver, and a hammer to assemble the kit. All you need to supply is the decor and imagination! Assembled in 5 easy steps! 1. Using the brackets already fastened to the front and back position the sides and screw together. 2. Secure the base with the pins provided. 3. 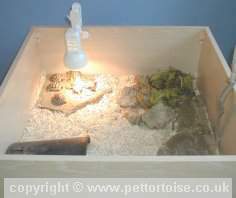 Position the basking lamp. 4. Push on the UV starter caps, Position and fasten the UV tube. 5. Finally decorate with imagination, and your done. 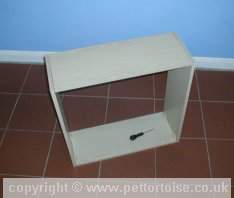 Well there it is, Our simple and practical solution to housing for the hatchling tortoise.